Size, heat, and efficiency concerns have long plagued the designers of power supplies. Now noise has joined the list, with customers complaining about the sound levels generated by the fans that are often needed to remove the heat from high-density power supplies. 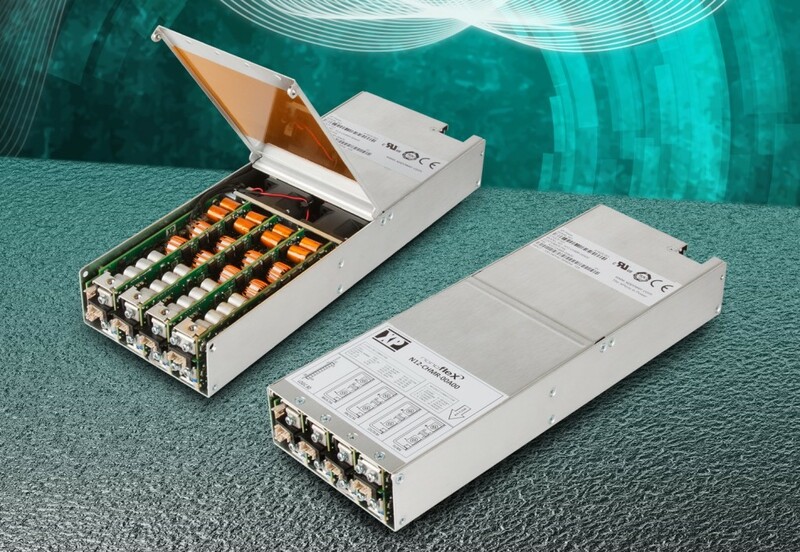 TDK-Lambda and XP Power are two UK companies that each turned to a combination of simulation, lateral thinking and rapid prototyping to come up with ways to cut noise levels in their latest configurable power supplies. Component placement proved the key for both design teams, with XP’s taking the unusual decision to move the fans into the centre of the chassis, away from the time-honored location of the AC-inlet end. The line of fans in the 1U-high XP NanoFlex supply divides the unit between the AC/DC converter and the array of plug-in DC/DC converters used to provide customisable output rails. A flat, custom-designed transformer built in six layers of a PCB module in place of a conventional wound design provides space for the vertically mounted DC/DC converter cards. “The planar magnetic are also more consistent because you are not relying on human windings: they are in the PCB tracks,” Blyth adds. Martin Coates, engineering project manager at TDK-Lambda, says the design team used both perception tests and measurements performed to the BSEN3744:2010 standard. The standard evaluates sound pressure level at the boundary of a hemisphere around the centre of the unit being tested. “We took the QMs up to a local recording studio to measure the sound-pressure levels. A combination of airflow simulation and prototyping guided the team on where to make changes to cut noise, eventually leading to a result of 44dB for the QM7 model. They measured competitors to levels of 50dB to 60dB. Martin Southam, director of marketing, says a change in the enclosure design for the QM series made it possible to engage in rapid physical prototyping. “This is the first time we’ve used plastic end mouldings. The prototypes were all 3D printed so we could move ports around to try to get optimum damping for the sound. The design of both companies’ products reflect the increasing need for rapid prototyping and fast turnaround at customers – even those in the medical sector. TDK-Lambda’s Goodwin says: “Many customers need quick-turnaround samples, and with full [medical] approvals. With a modular power, you can do custom development without the pitfalls of custom development. The modularity reduces the cost of change. If the customer, halfway through the project, changes the spec, we can quickly provide a new power supply. “The QM is really configurable: we have 600 billion possible configurations,” Goodwin adds. A key design imperative for XP lay in reducing the number of DC/DC modules the company needs to stock. This led to the decision to use Microchip Technology microcontrollers extensively so that the appropriate rail settings could be programmed in during assembly. “With Flexpower [the predecessor product family] we would have needed to stock 40 different modules. We can give customers samples more quickly now with just four modules and programming,” Blyth explains. For TDK-Lambda, design choices were also heavily influenced by the manufacturing strategy employed by the company, with components for the QM family made in low-cost areas such as China with final PCB and systems assembly taking place in the UK, with the aid of custom-built test equipment. “We manufacture in the UK but we’ve been using Far East low labor-cost partners for over 20 years. We have a really good understanding of low labor costs and what the cost drivers are. It has allowed us to develop very robust make-versus-buy processes,” Scotcher says. “It’s something that is easy to get wrong, especially when the decisions are based on assumptions and not understanding the true costs of outsourcing overseas. With a high-mix environment you have to bring that into the equation when deciding on make versus buy. We do use low labor cost areas for things like plastic mouldings and winding magnetics. We focus that on what you might call ‘the neck of the BOM’ before it spreads out. “In a high-mix environment, there are lead times, cost of inventory, and freight cost to consider. It takes a long time to bring stuff in by sea. But it costs a lot to bring in stuff by air: it’s five times more expensive to put things on the air than on a boat,” Scotcher adds. Having sufficient local inventory in place to support changes in demand is important to meet production demand on top of prototyping. “Many of our customers need to be delivering on short lead times themselves. It’s often four weeks for themselves,” Scotcher says. “Could QM be made in a low labour cost country? Yes, of course. But the question is does it really make sense? If you look at the way that the unit goes together, the make versus buy [from an offshore supplier] can be pretty marginal from a cost perspective,” Scotcher explains. At the plant in Ilfracombe, the individual PCBs for each module are often stuffed and soldered on a just-in-time basis. Each order is associated with a barcode that is used to define which programs automated equipment uses and in software that guides manual picking and assembly for non surface-mount components. Typically, the top side of the PCB contains the components that cannot be mounted by machine; the underside contains the bulk of the surface-mount devices. “The number of minutes that it takes to put it together [manually] isn’t very many: it takes less than two-and-a-half minutes to assemble a module.” Scotcher explains, and is easily outweighed by the shipping time for a similar unit assembled thousands of miles away in a contractor’s plant. “Many of our orders are one to five units. The average batch is 15. That’s not how mass manufacturing in China works. “If you assume raw material costs are global, in the long run that’s sort of true though over the short term you do find regional variations. But capital costs tend to be the same wherever you are in the world. So, the difference in direct costs are labor and some overhead. “With good design for manufacturing then the savings of moving to the Far East are less that many expect. We see single percentage point prime cost savings for mid-level assembly and the savings are getting less obvious,” Scotcher adds. The local manufacturing operation helps maintain good links with design. “The first thing on the agenda every morning is new product introduction,” Scotcher says, to ensure that the new designs can move down the production line smoothly. The experience underlines how subtle some of the issues are in design for manufacturing – and how a combination of simulation, rapid prototyping, and test need to be combined in the process.